March 18 & 28 – Tips and Tricks for Formatting Your Thesis: Little Things Mean a Lot! Explore more Library resources available at: http://search.library.ubc.ca/. cIRcle, UBC’s Digital Repository archived previous MURC collections starting back in 2008? 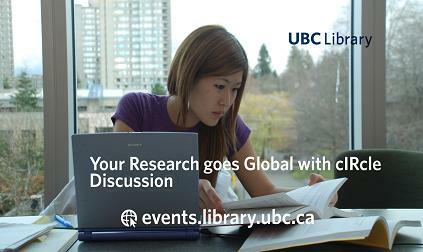 Visit the Undergraduate Research Opportunities collection at: https://circle.ubc.ca/handle/2429/535. UBC Library is proud to unveil a documentary film and a book looking at the fascinating stories behind the Wallace B. Chung and Madeline H. Chung Collection – a designated national treasure that was donated to the Library in 1999. 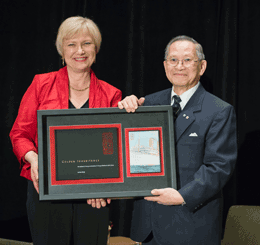 University Librarian Ingrid Parent with Dr. Wallace Chung. Photo credit: Don Erhardt. 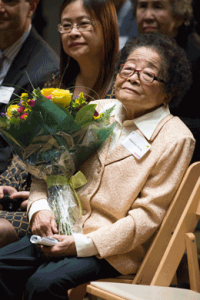 The book and film were formally unveiled on January 30 at a special event to honour Wallace and Madeline Chung. Many UBC professors and scholars were on hand to celebrate, including UBC History Professor Henry Yu and former University Librarian Peter Ward. UBC Chancellor Sarah Morgan-Silvester, who opened the proceedings, said the Chung Collection informs groundbreaking research and has a lasting impact on the study of Chinese Canadian history. Ward commented that “collecting is a deeply personal process,” and called the collection a “significant contribution” to UBC. In an onstage dialogue, Dr. Wallace Chung shared his thoughts about the collection, and reminded everyone that it is essential to forgive the past – but not to forget it. The production of the book and film were made possible due to a generous donation from Canadian Pacific in 2011. The donation is also helping fund the digitization of the Chung Collection. Since June 2012, the Library has digitized more than 1,200 items, totalling over 40,000 images. Dr. Madeline Chung. Photo credit: Don Erhardt. “The completion of a new book and film and the continuing digitization of the collection will open doors to the rich history and cultural importance that lies within these unique stories, artifacts, and documents,” said President and Vice-Chancellor Stephen Toope. 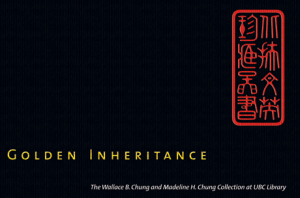 Golden Inheritance: The Wallace B. Chung and Madeline H. Chung Collection at UBC Library, penned by local author and UBC alumnus Larissa Buijs, provides an overview of Dr. Chung and his family, profiles the dedication and dynamics behind the Chung Collection, and offers an in-depth examination of its three themes: early B.C. history, immigration and settlement, and the Canadian Pacific Railway Company. The result is an absorbing read, accompanied by an array of images, that speak to an exceptional collection, its passionate collector and the broader forces that inspired the Chung Collection and helped shape today’s Canada. Dr. Chung has personally dedicated Golden Inheritance to his parents Chung Ham and Chung Hung Sze, and to the pioneers whose toil and sacrifices have made their dream of Gold Mountain a reality for all those who followed them. How can a collection tell the story of a nation, of a community, of a personal journey of discovery? Passage of Dreams: The Chung Collection is a documentary that features the stories of UBC alumnus Dr. Wallace B. Chung and his childhood love of collecting Canadian Pacific items. Featuring personal stories shared by Dr. Chung on his beloved artifacts, the film provides an important look at BC history from the perspective of early Chinese-Canadian pioneers. Produced by Gemini Award-winning producer Karin Lee and sponsored by Canadian Pacific, the documentary reveals how events from the past shape our distinctive Canadian identity today. 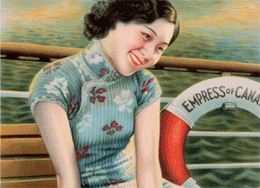 Says Lee, the “whole story of the Chinese experience” is on display in the Chung Collection. The book and DVD are currently in circulation at Koerner, Asian and Education library branches. The book and film are also on display in an exhibit until February 22, 2013 in the Level 2 foyer of the Irving K. Barber Learning Centre. MURC 2012′s winners! From left to right: Ian Wong, Alvin Ip, Tess Walker, Ryan Trenholm and Benjamin MacLeod. 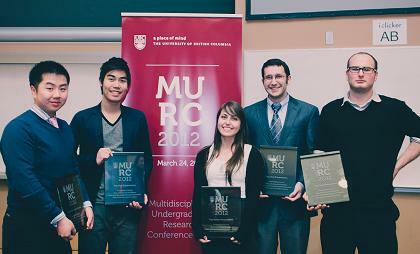 The Multidisciplinary Undergraduate Research Conference (MURC) is an annual, one-day celebration held in March which showcases the contributions of undergraduate scholarly inquiry and research at UBC. The conference is supported by the UBC Provost and Vice President, Research & International Offices, and is managed by the Vice President, Students Office. You may already know or have heard about it but what you may not know is that this year was made even more special for three of the MURC 2012 award winners. How so? Three of the MURC 2012 award winners – Alvin Ip (UBC Vancouver), Ben MacLeod (UBC Vancouver) and Ryan Trenholm (UBC Okanagan) – went abroad to represent UBC at the 8th Universitas21 Undergraduate Research Conference (July 1 – 5, 2012) at the Waseda University in Tokyo, Japan. 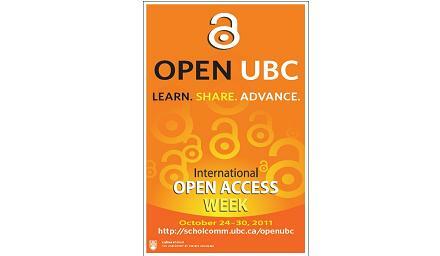 UBC is listed as one of the Universitas21 (U21) member institutions as seen at: http://www.u21urc2012.info/. In order to qualify, they were required to ‘compose a reflection essay on the U21 conference as requested by the UBC’s Go Global Office who sponsored their trip to Japan’, stated Alvin Ip. Congratulations to the three distinguished students mentioned above who represented UBC at U21 in Japan earlier this month! 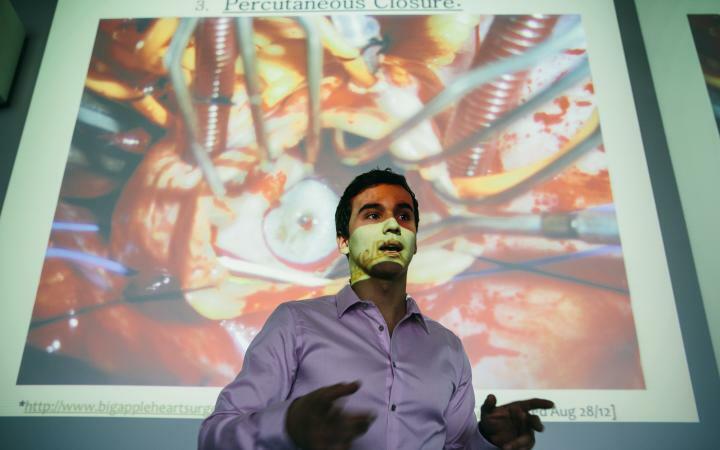 Previous and current Multidisciplinary Undergraduate Research Conference (MURC) conference presentations are available in the following cIRcle collections at: https://circle.ubc.ca/handle/2429/536, https://circle.ubc.ca/handle/2429/5744, https://circle.ubc.ca/handle/2429/21743 and https://circle.ubc.ca/handle/2429/42446. 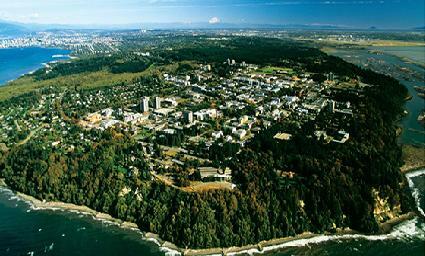 Above images and partial excerpts are courtesy of UBC’s MURC and the Universitas21 websites. Celebrate Research Week 2012 is almost here! As part of UBC Library’s events that are lined up for Celebrate Research Week 2012, don’t forget to attend cIRcle’s event next Thursday, March 8th at 2pm. We will be presenting first-hand feedback from faculty, students and librarians who have used cIRcle, UBC’s Digital Repository. They have made their research and conference papers, exemplary student projects, webcasts, podcasts and more available online through cIRcle. The top item in the Environmental Science Undergraduate Research Papers and Reports collection is entitled, “Waste solutions for Metro Vancouver”. To date, it has had over 300 views from Canada, USA, China, Russia, Japan, Ukraine, UK, United Arab Emirates, Argentina and Ethiopia. Take a look at it in cIRcle at: http://hdl.handle.net/2429/24466. Above image is courtesy of UBC Library at The University of British Columbia. UBC Library is proud to be part of Celebrate Research Week at UBC, which takes place March 2-9, 2012 and highlights research excellence across UBC’s faculties, departments, schools and partner institutions. As a #research partner at UBC, the Library connects faculty and students with local and global information resources, and enables new forms of knowledge creation, dissemination and exchange. 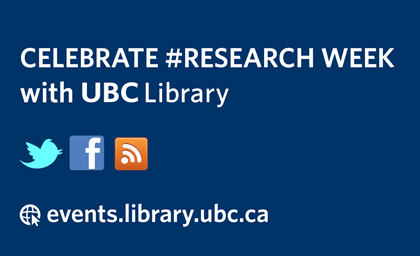 In addition to the events listed below, UBC Library will announce the winner of the 3rd Annual Innovative Dissemination of Research Award at the Celebrate Research Week Gala. Established by the Library in 2010, this award focuses on new and innovative ways of communicating and disseminating knowledge. Librarians from our Life Sciences branches will host this all-day workshop for those planning or beginning a systematic review, or wishing to improve on locating and managing a comprehensive literature search. Open to post-graduates, researchers and research assistants. Morning and coffee breaks included, but please bring your own lunch. Mar. 6 | 11:30 a.m. – 12:30 p.m. Develop an understanding of use permissions for copyrighted materials and licensed material, author’s scholarly rights and publisher agreements. Information covered is ideal for researchers, instructors and faculty. Mar. 8 | 9:30 a.m. – 11 a.m. Designed for graduate students at the Sauder School of Business, this workshop will cover how to set up alerts for: business and finance news; articles in your research area; the latest issues of important journals and business books at UBC Library. Mar. 8 | Noon – 1 p.m. In collaboration with campus partners, UBC Library was recently awarded a Teaching and Learning Enhancement Fund Grant to develop two new services as part of the Koerner Library Research Commons (now under development). Come to this session to hear more about these new services, new spaces being considered, and to contribute to our planning process. a Thesis/Citation Formatting Support service, which will provide workshops and specialized assistance to graduate students as they work on their theses. Mar. 8 | 2 p.m. – 3 p.m.
UBC’s digital repository, cIRcle, makes papers, dissertations, student projects and webcasts available to the world as online open resource. As part of Celebrate Research Week, cIRcle is holding an informal discussion on the merits of adding your scholarly research to a digital repository. Hear first-hand feedback from faculty, students and librarians who have used cIRcle to propel their research. As of the end of February, there were more than 39,600 items in cIRcle. Explore cIRcle for your #research needs. Mar. 8 | 2 p.m. – 4 p.m.
Our new Digital Initiatives Unit is a key part of the Library’s digital agenda. Its goal is to create sustainable, world-class programs and processes to make collections and research accessible beyond UBC.